They weren’t the best thing he ever did, or the one which we’ll cherish the most. 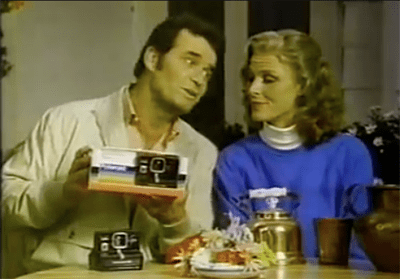 But with the sad news of the passing of James Garner, it’s worth pausing to remember the commercials he did in the late 1970s and early 1980s for Polaroid. And–this being Technologizer–it’s how we’ll memorialize him here. When it came to celebrity spokespeople, Polaroid wasn’t stingy: Laurence Olivier did the first ad for the SX-70 camera, and Danny Kaye touted the ill-fated Polavision instant movie system. Hiring James Garner was a similarly classy move, but the ads he appeared in weren’t like anything which Polaroid had done before. Or anyone else, really. If you weren’t paying attention to TV commercials back when the Garner spots first appeared, it’s impossible to understand how fresh these ones were at the time–in part because they were widely imitated and their influence is felt to this day. Like everything Garner did, the spots felt effortless, and defined by his personal style. If Polaroid had hired some random other guy from a 1970s detective show–Mike Connors from Mannix, say–the campaign would likely have been prosaic, short-lived, and quickly forgotten. The ads below are all from YouTube, and the years specified are from the descriptions there. I wouldn’t be surprised if some of them are off. 1977: A prototype with no Mariette Hartley, no bouncy music, and low production values. 1978: Another one which feels like a rough draft for the campaign to come. Is that Mariette Hartley in a non-speaking role in this 1978 ad for the iconic rainbow-stripe OneStep? I’m not sure. 1978, with Hartley and the OneStep and the style in place. 1978, also for the OneStep. 1980, for Time Zero, an upgrade to SX-70 film which developed faster. 1980, with about as close as the campaign got to a hard sell. Christmas, 1980, for Time Zero. 1981, also for Time Zero. This 1981 commercial actively encourages the misconception that Garner and Hartley are a married couple. A couple of 1982 ads from when the campaign was getting long in the tooth. Both try too hard to be heartwarming, in a way that makes me think of Kodak, not Polaroid. One is even Hartley-less. 1983, for a cost-reduced version of the Sun Camera. The dialog involves Polaroid not needing Garner and Hartley to sell this model–and indeed, the campaign was winding down. I’m not sure why these spots ended, but Polaroid never topped them. (In fact, it didn’t seem to try–its ads got mundane, and stayed that way.) Re-watching them has always made me miss the old Polaroid. Now it makes me miss Jim Garner, too. I have to say that this was a GREAT job you did pulling all of these commercials together. Bought back a lot of memories. Thanks for taking the trouble to post these. They are fun ads and, as you noted, were groundbreaking for their time. I was living outside the US for most of the time they appeared here. I will always remember how great Polaroid cameras were! James Garner and Mariette Hartley were the best and I am glad that their Polaroid campaign carried on for years. Like a family tradition! If you remember these ads, you were in a good place then! Rest in peace, James! Always loved these ads! They made a great couple! Thanks for putting thee together…made a lot of memories come back. I HAD a Poladoid One Step and it was great! Thanks for the memories. I worked at Polaroid when these commercials aired. It was fun seeing a couple of years of engineering effort turn into something that became so widely used. Polaroid had a great capability to develop excellent products and create worldwide recognition through great marketing campaigns.